Moving the Needle: David Ross puts the Braves ahead with a two-out, RBI single, +.619 WPA. Really, I covered the entire story here. 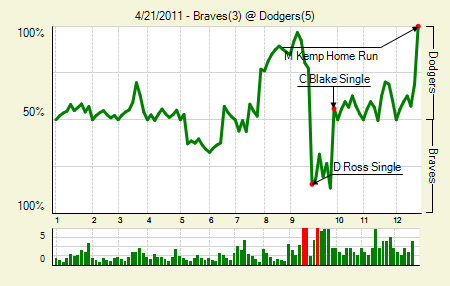 It was a huge moment for the Braves, as they came back after having none on and two outs against the Dodgers’ ace. But it ended in tragedy when their own manager made a questionable decision in extras. 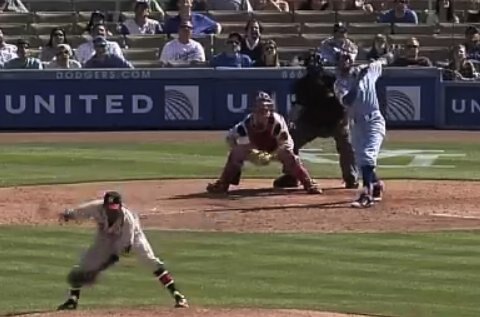 Clayton Kershaw: 8.2 IP, 5 H, 3 R, 3 ER, 1 HR, 4 BB, 7 K, 1 HR. Really, this would have looked a ton better if Mattingly had removed Kershaw after eight. But he had allowed so few baserunners to that point — just two hits and a few walks — that the decision was understandable. Casey Blake: 3 for 6, 1 HR. I think that every time Blake does something awesome from now on someone will bring up the Santana trade. It was just that ridiculous. Matt Kemp: Again, read the above-linked story for the story of Kemp’s walk-off bomb. 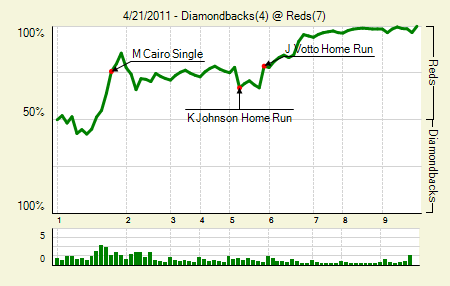 Moving the Needle: Miguel Cairo breaks a tie in the first, and Joey Votto adds to the lead with a homer, +.116 WPA each. Yes, we have a tie for the biggest WPA swing of the game. The first instance came in the first, when the Reds loaded the bases with one out. Cairo snuck one between third and short. Votto scored easily from third, though more amusing was Jonny Gomez barreling around third, to the plate, past Votto, and straight into the dugout. Then, in the fifth, with the Reds up 4-3, Votto hit a hiiiiiigh bomb off of Dan Hudson, Moving the Reds’ lead back to two. That was enough, though they’d tack on a few more for good measure. Ramon Hernandez: 2 for 3, 1 2B, 1 HBP. He continues his hot start. Maybe he’s still running on the adrenaline high of his Opening Day walk-off grand slam? Stephen Drew: 2 for 4, 1 HR. That was his first homer of the season. That will boost his already excellent .372 wOBA. 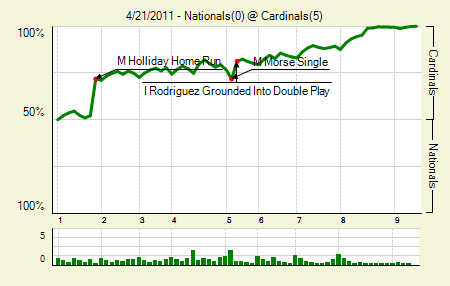 Moving the Needle: Matt Holliday goes deep in the first, +.196 WPA. Just like the draw it up, right? Pujols walks, Holliday homers. It was actually a pitch that appeared well outside, but Holliday reached for it and pulled it into the bullpen in left-center. That gave the Cardinals an early 2-0 lead. They’d tack on three more, but they wouldn’t quite need them. It was one of those days at the office. Albert Pujols: 1 for 3, 1 HR, 1 BB. He added some insurance with a two-run blast in the eighth, following a Colby Rasmus walk. That’s five homers in his last seven games. Kyle Lohse: 9 IP, 2 H, 0 R, 2 BB, 6 K, 7 GB. He’s gone at least seven in every start this year. His last complete game: April 12, 2009. Moving the Needle: Jim Thome singles home a run, +.132 WPA. 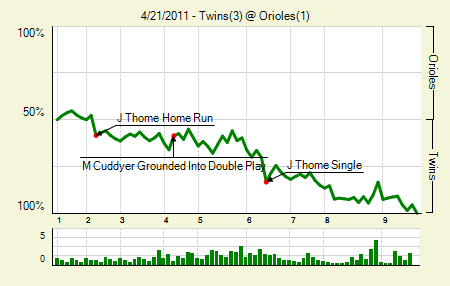 Oh, Thome mashed a tater in this one, oh yes he did. That came in the second inning, a solo shot that gave the Twins a 1-0 lead. In the sixth the score still stood at 1-0, but the Twins were threatening with runners on first and second with one out. Thome, facing Orioles starter Jeremy Guthrie , laced a single to right-center, scoring a run and putting a runner on third. The Twins didn’t bring him home, but they did tack on another in the eighth. The three runs is actually the exact number of runs per game the Twins have scored this season. Michael Cuddyer: 1 for 3, 1 HR, 1 HBP. That’s two homers in two games for Cuddyer, who started off the season with a long slump. The Twins need him, too, with Justin Morneau floundering (and out with the flu), Joe Mauer on the DL, and the offense generally flailing. Scott Baker: 7 IP, 4 H, 0 R, 1 BB, 9 K. We know Baker has some games like this in him. Again, with the lack of run scoring, these become more important at this point in the season. 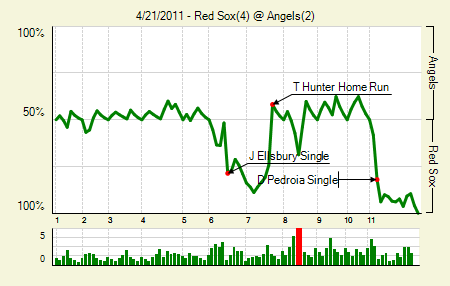 Moving the Needle: Torii Hunter ties the game with a homer, +.325 WPA. There’s no better word to describe the start to Hunter’s 211 than struggle. He’s just 17 for 81 (.210) with only five walks and zero, yes zero, doubles. But he does have four homers, and I know that at least three of them he has absolutely murdered. That includes last night’s bomb, which tied the game at two. He gave a nice little bat flip to celebrate the no-doubt nature of the shot. The Red Sox went on to win in extras, but Hunter’s hit swung the game more than any in the string of Red Sox hits that won them the game. Dustin Pedroia: 3 for 4, 2 BB. On base in five of six plate appearances. Ho hum. Josh Beckett: 8 IP, 3 H, 2 R, 2 ER, 2 BB, 5 K, 1 HR. The homer to Hunter was his only real mistake. It’s a shame, really, that the Sox couldn’t put together a couple of more runs for him. Moving the Needle: Scott Cousins hits a granny, +.197 WPA. I’m kind of surprised this one didn’t move the needle further. Usually the biggest swings come when a team is down and then on one hit go up by a run. 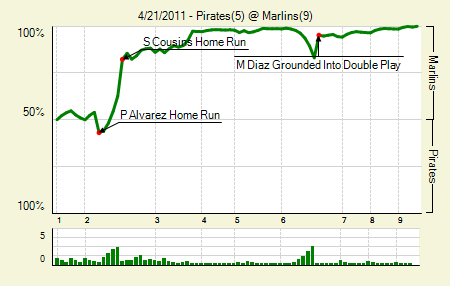 In this case, the Marlins were down and then went up three runs on one swing. Couins’s shot out to right-center boosted the Marlins, who would score five more throughout the course of the game. Honestly, and I say this with the deepest empathy for Pirates fans, the only interesting part of this entire series was Josh Joshnson ‘s performance in the first game. Pedro Alvarez: 3 for 4, 1 2B, 1 HR. But hey, at least the Pirates can take this as a positive. Alvarez has started slow, but maybe, just maybe, be builds on this one. And now I’ll quit it with my convenient narrative points. Mike Stanton: 1 for 2, 1 HR, 2 BB. Craziness: this was Stanton’s first homer of the season, yet he has a .231 ISO. That’s what happens when six of your eight previous hits are doubles. Moving the Needle: Melky Cabrera shows his clutch side, wins the game for the Royals, +.458 WPA. Though he’s not a very good player, Melky has a knack for these clutch moments. I don’t know what it is, and I know that he fails in them frequently, too. But watching the Yankees in 2009, it seemed like when the Yankees needed a big hit in a walk-off situation, he was there to provide it. He did that for the Royals yesterday, knocking a bases-loaded single in the bottom of the ninth to bring his team back from a 2-1 deficit and hand the Royals the victory. He also tripled earlier in the game. Josh Tomlin: 7.1 IP, 5 H, 1 R, 1 ER, 1 BB, 4 K, 11 GB. One day, some team will figure out Tomlin. Until then, he’s helping propel the Indians. 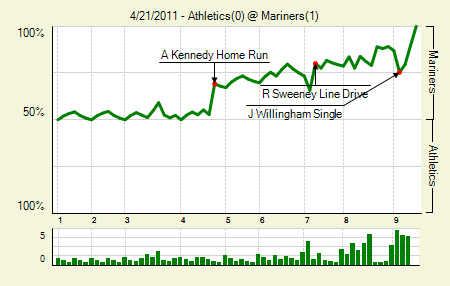 Moving the Needle: Adam Kennedy provides the game’s only run with a solo homer, +.164 WPA. All it takes is one mistake, and the 3-1 pitch to Kennedy was a cookie. He took advantage and smacked it out of the park to give the M’s a 1-0 lead. The real story of this one, of course, was the pitching. Felix Hernandez: 7.2 IP, 4 H, 0 R, 3 BB, 8 K. He’s been good, not great, in his previous four starts. He was great in this one. Brandon McCarthy: 8 IP, 4 H, 1 R, 1 ER, 1 BB, 6 K, 1 HR, 11 GB. He’s already given the A’s way, way more than anyone thought possible. It’s hard to say anything now, because we know McCarthy’s track record. But he’s on his way to being the best value signing of the winter. Moving the Needle: Mike Nickeas goes deep to open the scoring, +.134 WPA. See? I told you the Mets weren’t this bad. They came out swinging against the Astros last night and helped erase a tough loss from Wednesday. 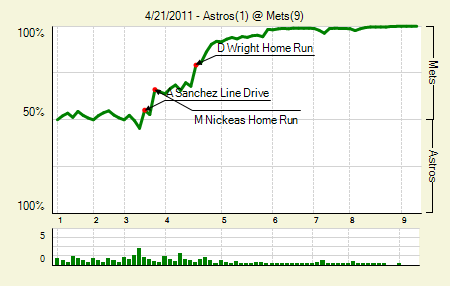 Nickeas’s homer was the first of his career, and it gave the Mets a 1-0 lead. The Mets continued to tack on, and got some great pitching out of their own value signing. Chris Capuano: 7 IP, 6 H, 1 R, 1 ER, 2 BB, 4 K, 9 GB. This has worked out about as well as the Mets could have imagined. They can’t rely on him for this going forward, but he still might have a decent season left in him. David Wright: 2 for 3, 1 2B, 1 HR, 1 BB. Trade David Wrong! Sorry. I always find it funny to repeat this knee-jerk Mets’ fan reaction after he shows exactly why he’s one of the best third basemen in the league. 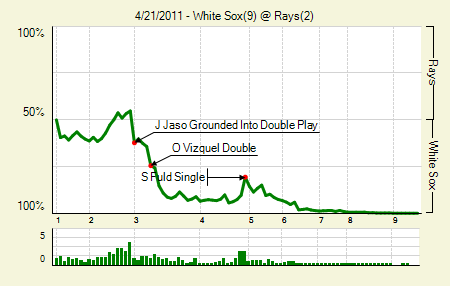 Moving the Needle: John Jaso kills a rally with a double play, -.170 WPA. The Rays really hurt themselves in this one. In the first inning Felipe Lopez threw away a fielded bunt that allowed Juan Pierre to reach third with none out. Then, in the second, with the bases loaded and one out, Jaso grounded into a rally killing double play. The White Sox immediately made them pay, racking up four more runs in the top of the third and essentially sealing the game. Also, the Sox score as many runs in this game as they had in their previous six games combined. Paul Konerko: 3 for 5, 1 2B. In a season when the common line is “he can’t be as good as last year,” Konerko has been, well, not as good as last year. But he’s still off to a damn fine start, with a .388 WOBA in his first 19 games. Moving the Needle: Ben Francisco homers for the game’s first run, +.122 WPA. Mat Latos ‘s rough start continued last night, as he allowed three runs in the first three innings. Two came on solo home runs in the second, the first of which was a shot over the center field wall by Francisco. He also came through in the third, though it was a sac fly with the bases loaded and one out. 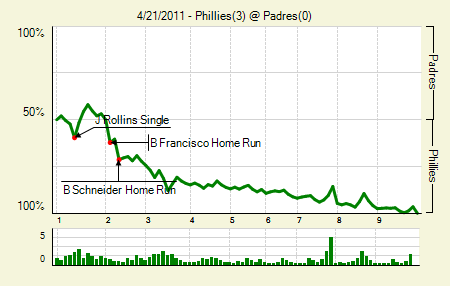 It gave the Phils another run, and the third run can be important. Placido Polanco: 2 for 4, 1 BB. That’s the only multi-hit game for any player in this one. Roy Oswalt: 6 IP, 1 H, 0 R, 2 BB, 7 K. It took him 106 pitches to complete six, though they were dominant all the same. We hoped you liked reading The Morning After: Game Recaps for April 21st by Joe Pawlikowski! 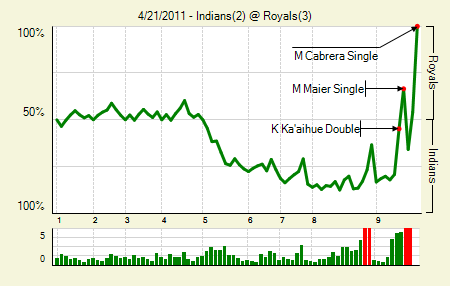 Note on the Royals game: It was 2-1 Indians and Melky plated two runs.